Ship this as a Gift! Soaps inspired by Alaska's Pristine Wilderness. Handmade in small batches, each 4 ounce bar is made from saponified olive, coconut and palm oils. These oils are blended with natural pigments and pure essential oil and or fragrance oils. After the mixture is properly mixed it is poured into wooden molds which are then covered and insulated for at least 24 hrs where they will continue to process. Once this is over they are popped out of their mold and cut into loaves which are again cut into bars. The racks of soap are left undisturbed for 3-6 weeks while they continue to harden and cure. Each bar is trimmed by hand, polished, and wrapped with its label. 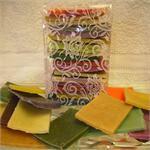 Many of our soaps contain locally gathered ingredients. No animal products are used EVER. Free of commercial processing, our soap retains its natural glycerine, resulting in a creamy long lasting product. Gentle enough for the most sensitive skin. A full 1 pound bag of soap ends. Useful sized soaps in many scents and varieties that are the end cuts and trimmings. Pieces too good to toss away. Sweet and crisp berry scent. This one will remind you of summer in Sitka! Gorgeous, fragrant roses bloom all summer long all over Alaska. The "Sitka Rose" produces large edible rose hips, and is often used as borders or hedges. This pale pink soap is silky smooth, superfatted, and very feminine. Our most beautiful bar of soap…pure sweet almond oil, rich moisturizing shea butter, and an irresistible fragrance make this soap nothing less than decadent. Pink and purple swirls, smooth and silky. Affordable luxury. Hand-picked Alaskan wild-crafted flowers and soothing herbs, gently steeped in sweet almond oil add a natural goodness to this soap. With its gorgeous fragrance, it's always a favorite. A generous scoop of moisturizing honey, made from the local fireweed blossoms, is stirred into every batch of this golden soap. Warm with the fresh scent of honey and pineapple. the Tongass National Forest is home for WinterSong, providing us with soft pure rainwater- in abundance! We’ve captured that fresh forest mist in this pale green bar. A clean and fresh scent. Midnight Sun is a superfatted soap with a heavy dose of shea butter which makes this bar very creamy and rich. Great for dry skin and scented with mandarin orange oils. This delicately scented soap is super fatted with an extra dose of pure sweet almond oil. The scent of fresh picked lilacs will remind you of Spring. Smooth and creamy, it's perfect for dry skin. Inspired by the bounty of wild berries on our Baranof island, this intensely fragrant soap is swirled with blue, white and purple. Looks and smells irresistible. A best seller! A beautiful superfatted bar, naturally colored the gorgeous icy blue of Alaska's glaciers. Lightly scented with a unique, fresh scent. This spicy, woodsy soap celebrates the arrival of Spring in Southeast Alaska. The new, bright green tips of Sitka Spruce match our fresh, fragrant batches of Spruce Tip soap. A natural choice for nature lovers. This mineral bar begins with hand gathered fresh seaweed, harvested from the pure clean waters of Southeast Alaska. A striking, green-swirled bar with the fresh scent of the sea. One of WinterSong's original soaps, we created this as a serious scrub for hard working hands. It seems to have found its way into many a local shower, though. The base of essential oils combined with the scrub of organic cornmeal feels wonderful. A rich, fragrant soap much loved by the men (and women) of Alaska. Sandalwood and vanilla in a smooth earth-colored bar. This popular soap is now made with Sitka's own, locally roasted, Highliner coffee beans! Freshly ground coffee...fragrant vanilla...skin softening almond oil...artfully combined into a deliciously scrubby bar of soap. Grizzly Scrub is strong enough to clean a Grizzly Bear! But we recommend dirty hands! Made with Cinnamon and Cedar essential oils and the tough scrubbing ingredients of pumice, ground coffee, loofah & poppy seeds. Sweet apple and spicy cinnamon scented soap. For people who have to have chocolate! BUY 12 BARS and pick one free bar from this list BELOW. Choose a free bar if you ordered any 12 single bars at the Regular Price! Choose from the list, or let us choose for you, and we'll add it to your order!